Dr. Harn is a native of the Dallas area. He received his undergraduate degree from Baylor University in 1997, and after college he lived in San Francisco working in the financial sector. He later returned to school and earned his medical degree from the University of Texas Southwestern Medical School, Dallas, TX in 2006. Dr. Harn remained in Dallas to complete his residency training at the University of Texas Southwestern Medical Center, Parkland Hospital. 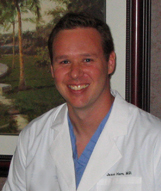 Dr. Harn joined Northlake OB/Gyn in 2010. He is board certified, a member of the Texas Medical Association, and a Fellow of the American College of Obstetrics and Gynecology. Dr. Harn is married to Dr. Laura Harn who is a pediatrician also practicing in Frisco. They have three young boys, Lincoln, Jackson, Brecken and one daughter Brynley. He spends his free time playing ball with his boys and taking walks with his wife and daughter. Dr. Harn loves the outdoors and enjoys hiking, hunting, snow skiing, and water skiing. Click below to read Dr. Harn's full Curriculum Vitae.